In the case of this particular garden, four large trees have provided both shade and root competition. They straddle the west side of the garden — an ancient apple, two green ash and one butternut — and it was a surprise to all that the ash were the first to fail. As everyone in Ottawa now knows, the last two years has seen the emerald ash borer decimate the green ash population in our city. It seems few trees have been spared and the two in this garden have also unfortunately joined the list. Apple trees are prone to every single type of insect and pathogen, but this beloved tree is still kicking. The butternut is also defying the odds, as many have been succumbing to butternut canker, a fungus that has been killing trees quickly since the 1960s. When I first came to this garden, the planting under the trees along this fence line included a very mature hedge of French hybrid lilacs with an under-planting of Annabelle hydrangea. The lilac bushes had long since stopped blooming as they were in day-long shade, but the hydrangea (for which the homeowner had expressed her disdain) were thriving. You may not know this but Annabelle hydrangea *always thrive*. I can’t recall how long it took us to dig out both the lilac and hydrangea or how deep our excavations went, but our efforts spanned more than one visit and the biggest challenge may have been distinguishing between the roots of the plants that we were removing versus those of the trees we believed were staying! 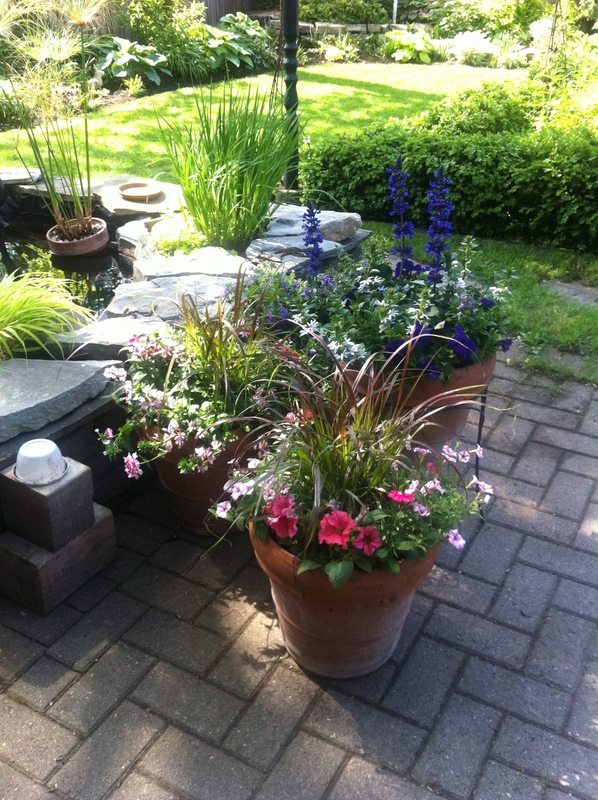 Lilac and hydrangea gone: check. New fence: check. 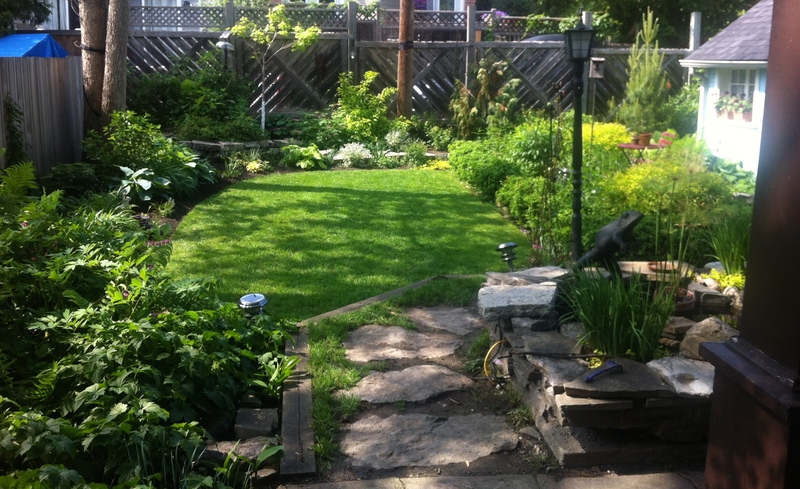 Shade-loving perennials placed in east-facing bed: check. 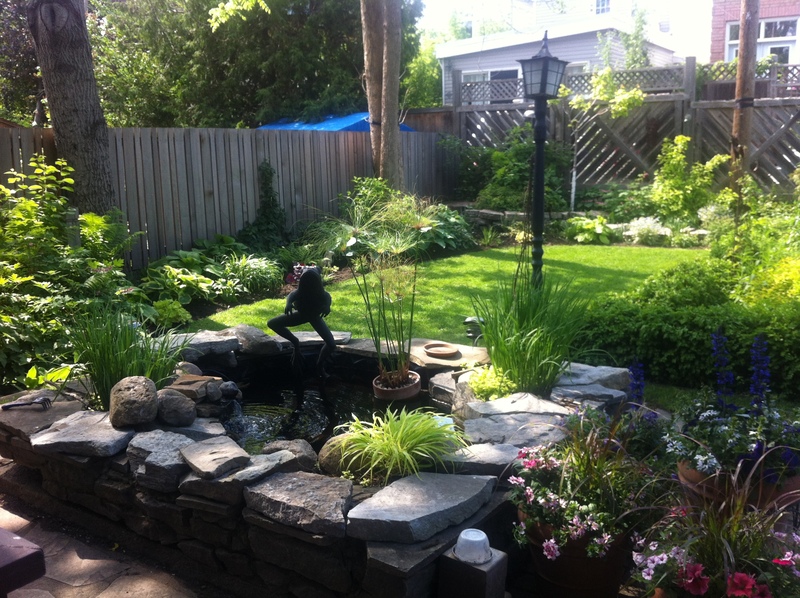 Raised stone herb garden converted to small pond: check. This garden is now a lush oasis with not only a million shades of green but spaces for the homeowner’s small kids to play: the raised pond provides endless fascination, the small lawn a place for them to play and the plants an opportunity to learn their names….as I’m told is actually happening, even with their 5 year old boy! 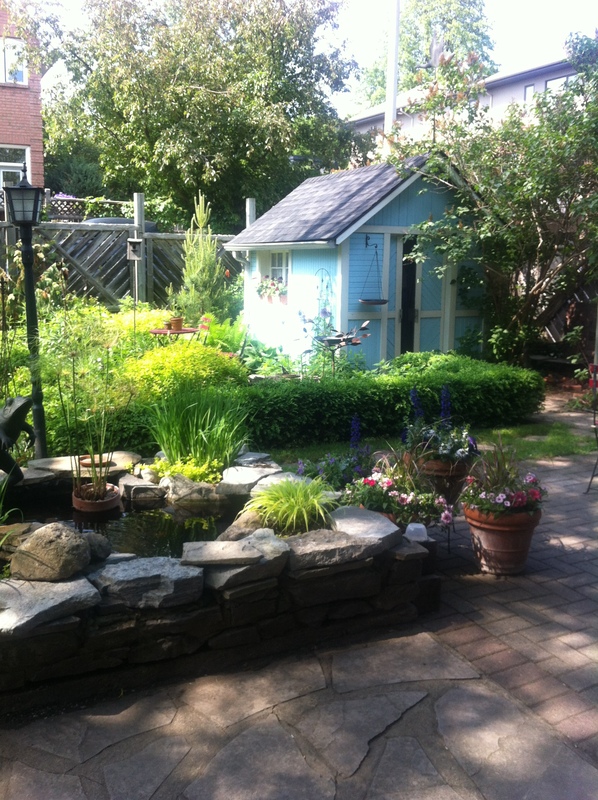 A blue garden shed is not only a place to store tools and the like, but also a focal point. More than this, it provides the kids with an opportunity to play hide and seek….and the flagstone patio surrounded by a sunny garden to it’s left provides a spot for the adults to sit and contemplate life — notice the bright red bistro set.